We strive to fulfill this mission by providing parts for our products, simplifying the parts ordering experience & providing free technical advice from experts knowledgeable on our tools. 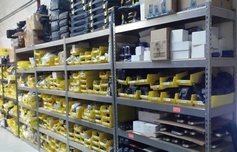 We stock thousands of parts for new and tools previously sold over the 10 years we have been in business. Our in-house call center is staffed by knowledgeable people who “get” tools. We also promptly process and ship your orders in Canada or the US. We strive to provide quality tool parts and excellent service to you, our valued customers. Call us to speak to a Customer Service Representative in English or French between 9a.m. – 5p.m., Monday – Friday EST. We offer free technical support on our tools, provide parts under warranty and a broad selection of parts for purchase including, motors, switches, carbon motor brushes, housings, power cords, chucks, gear boxes and other serviceable components. Power Tools Plus, located in Pickering, Ontario, Canada, is a company dedicated to supporting the quality retail brand power tools provided through our manufacturing partner. Customer satisfaction and quality service are our priorities.